To be honest, I’d been pretty irregular in performing my monthly self breast exams (SBE) over the past many years. This was primarily due to the fact that my breast tissue was so lumpy and “dense” that it would obfuscate the exam to one of pointless effort. That’s what I told myself. Truth be told, I knew where the lumps and bumps were and got used to feeling them. However, as I started approaching menopause, that lumpiness began to change. My negligence in doing my exams was no longer the result of the somewhat confusing exam but more of not having a consistent trigger to do the exam. I had to come up with another way to stay on top of it. I needed a system that would make it easy to be consistent so, a few months ago, I decided to use the “full moon” as the day that I would perform the task. I works out well as, by the Ashtanga Yoga tradition, I do not practice yoga on “moon days” (when the moon is in either the full or new moon stage) thereby giving me the luxury of an extra 1.5 to 2 hours of time every 4 weeks. On the morning of September 5th, when the moon was full, I lay back on my bed to begin my check. First I examined the left breast. Then the right. I made two passes: one in a circular fashion and one dividing the tissue into wedges (moving from the middle to the outer edge and back). It was on the 2nd pass that I found a peanut size, semi-firm lump. I took a few deep breaths and felt again. It was still there. Remembering my mammogram (which had to be repeated due to the radiologist seeing something of concern), I immediately messaged my OB/GYN. She had just examined me a few months earlier so I was hopeful that the lump was something she might have felt. She hadn’t though. I saw her the following day for an exam after which another diagnostic mammogram and ultrasound was ordered. A couple of weeks later, I had the texts repeated again. As the radiologist came into my room to re-check the ultrasound herself, I was told that my results were “negative.” But I was also told that due to the exam findings that my doctor wrote, I would need to be examined again by the Breast Care (read: cancer) Surgeon. I tried to stay calm and objective, although a part of me wanted to freak out. Somehow, I managed to maintain a positive outlook, especially when informing my sons what was up. They each took it in with both concern and vision of a hope – which in turn helped me tremendously. They were relieved that I was not ignoring it but, rather, doing everything I needed to do to be certain that I would have a good outcome – even if it were to be cancer. Affirming to be strong and weather the storm, even if it meant the loss of both breasts, I began looking into what I might be in for should the mass be cancerous. I even searched for Ashtanga practitioners who resumed their yoga practice after mastectomy. I felt prepared for whatever news would come at the appointment with the surgeon. All that positivity and objectivity began to slip away while I was sitting in the Breast Care/Surgery Department waiting room. The longer I sat there, the more fear crept in and the more alone I felt. My eyes were welling up with tears as I let my mind contemplate the possibility of surgery, recovery, radiation/chemotherapy, time off of work, and the financial burden. The wall of optimism that I had put up for my sons, and theMAN, had crumbled and devastation was descending upon me like a hurricane. I managed to walk away from the path of destruction, albeit barely. As soon as my name was called, I was able to pull myself together. I think that is because I was no longer waiting but was now empowered by taking action once again. 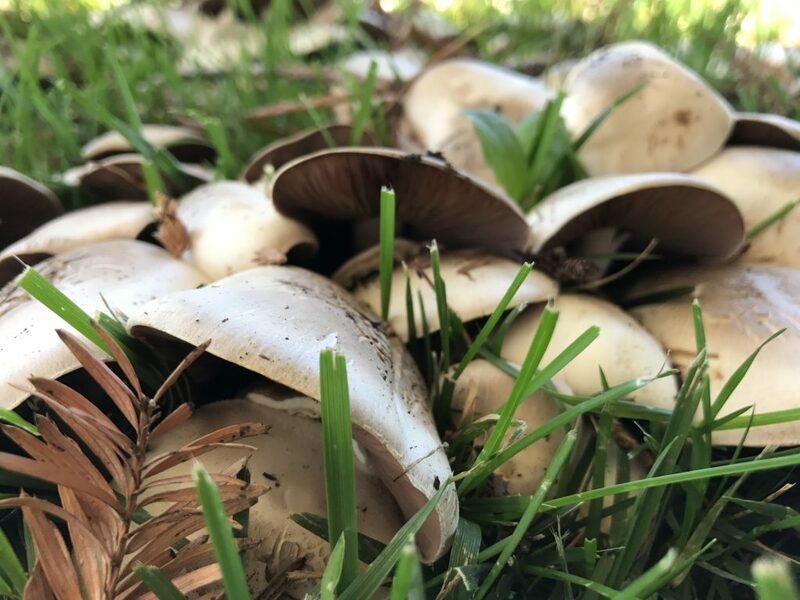 I noticed these mushrooms growing under the redwood tree in front of the office on Monday. The cluster of cute little mushrooms has since morphed into these rather large fungi which seem to be fighting each other for space and sunlight.